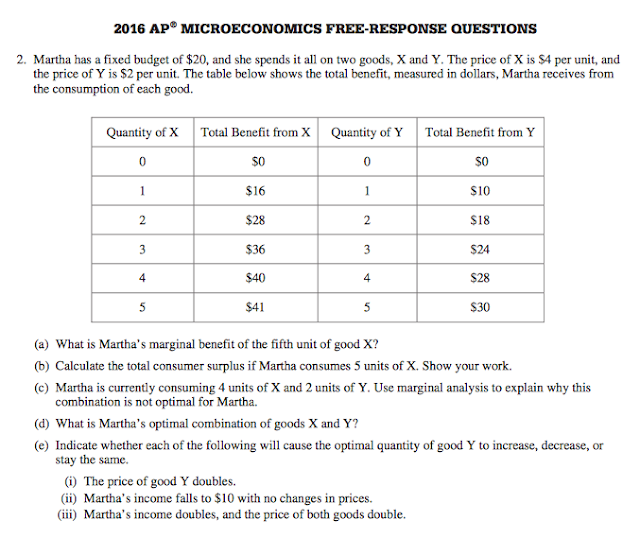 (A) What is Martha’s marginal benefit of the fifth unit of good X? At a quantity of 0, we haven’t purchased any units so there is no marginal benefit. 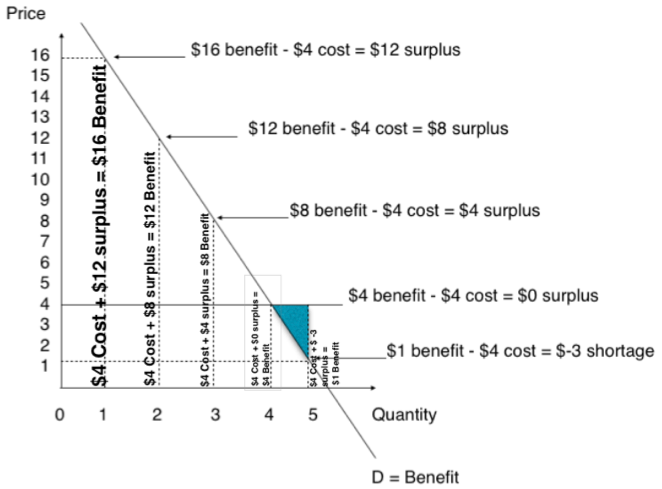 As we purchase from 0 quantity to the first unit of X, we gain a marginal benefit of $16. As we purchase from the first to the second unit of X, we gain a marginal benefit of $12. As we purchase from the second to the third unit of X, we gain a marginal benefit of $8. As we purchase from the third to the fourth unit of X, we gain a marginal benefit of $4. 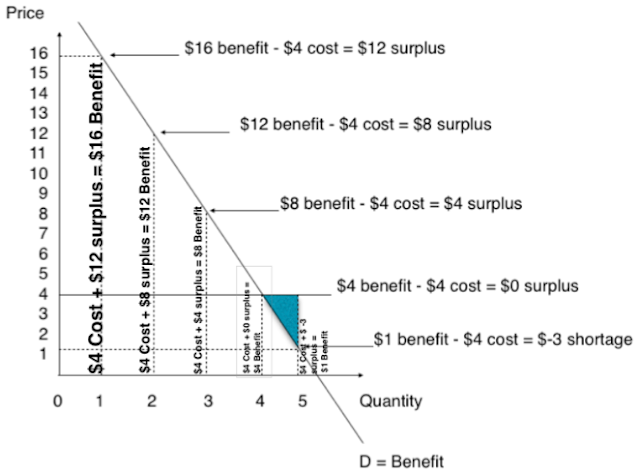 As we purchase from the fourth to the fifth unit of X, we gain a marginal benefit of $1. Think of marginal as meaning the next purchase. Obviously we can only purchase full units, so when we have 4 units purchased our next marginal purchase is the 5th one and we receive a marginal benefit of $1 from the additional/marginal purchase of that 5th unit. 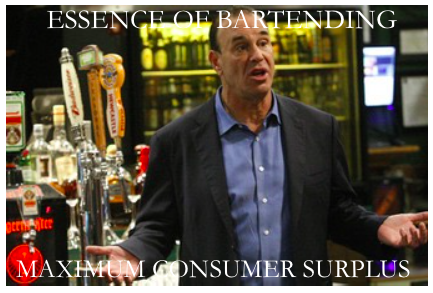 Remember, that consumer surplus is the additional value gained from consumption of a good subtracting what has been paid for that good. · Understand that the $4 Cost is also part of the benefit. Confusing at first, but understand that if I give you $4 for unit X then unit X is still worth $4, at least to me. (C) Martha is currently consuming 4 units of X and 2 units of Y. Use marginal analysis to explain why this combination is not optimal. This combination of Units X and Units Y are not optimal as the marginal benefit gained from purchasing units X and Y is not equal. We are use to seeing these problems as Utility problems and recognizing that the Marginal Benefits and Marginal Utility formula’s are the same. (D) What is Martha’s optimal combination of X & Y? 2nd – Martha chooses her purchases according to the greatest benefit gained with each purchase. 3rd – Martha purchases until her income is all spent. E) Indicate whether each of the following will cause the optimal quantity of good Y to increase, decrease or stay the same. (I) The price of good Y doubles. If the benefit per unit of Y decreases, then we would purchase less of the good. Martha’s first purchase would have been X as the benefit is 4, which is greater than the benefit of 2.5 for a unit of Y. Answer - The optimal quantity purchased will decrease. (II) Martha’s income falls to $10 with no change in prices. If Martha’s income falls to $10, then she will not be able to purchase 4 units of good Y. She will purchase the first 3 units of good X & Y exactly the same way, but then she has spent $8 and only has $2 left, so she will then only be able to purchase a unit of Y. So 1 unit of X and 3 units of Y will be purchased, this will use all of her income. The question above asks if the optimal quantity of good Y will decrease, increase, or stay the same. Originally Martha, with $20 of income bought 4 units of good Y, so her purchase of good Y has decreased. Answer – Martha’s purchase of good Y has decreased. (III) Martha’s income doubles and the price of both goods double. The answer to this question should be intuitive in that if Martha’s income doubles and all goods prices double then Martha is no better off with a doubling of her income as the ratio of prices to incomes are the same. Martha has spent $40 (all) of her income and bought the same combination of goods X & Y. Answer - No change in optimal combination of goods X & Y.